Give the Starbucks a miss and head to these fantastic places for a caffeine hit in central London. A newbie on the Covent Garden scene, Drury 188-189 offers coffee, cake, lunch and brunch with a side of vintage books. Drop in for a freshly pressed juice and a selection of their salads for lunch or check them out at the weekend where they serve a cracking brunch menu until 2:30pm. Just around from Matilda is a vintage style, small but perfectly formed café which makes the perfect pit-stop for tea and cake. From carrot cake to muffins, cookies to giant Jaffa cakes, there is a sweet treat for every palate – head downstairs for more seats. With a selection of indie magazines to flick through, and a daily changing menu of warming soups, wholesome salads and inventive bakes to tempt your taste-buds, The Black Penny on Great Queen Street is not to be missed. Their brunch is also something special – choose from options such as ‘The Gatherer’ – eggs, halloumi, toast, mushrooms, spinach and baked beans- for a veggie feast, or Crispy Confit Duck Hash for a serious morning-after cure. For those of you that don’t know, Stanfords is pretty much a London institution when it comes to book shops. Dedicated to travel writing since 1853, this Covent Garden beauty has maps and guide books galore for your upcoming trips as well as tons of ideas of where to venture next. Tucked at the back is a café; a rare oasis of calm amid Covent Garden’s bustle where you can refuel and peruse your purchases. It’s true that this hip all day café/eatery/bar and restaurant seems to sometimes have more Macs than people staring back at you, but that is partly why it makes a good spot to settle down with your laptop and get working. Super-fast wifi, plenty of plugs and attentive staff that won’t shift you even after hours of furious typing, you can stay here from morning coffee, through scrummy lunch to much-needed cocktail. Tucked just behind Holborn Station and a mere five minute walk from Covent Garden, Fleet River Bakery could easily pass you by: this would be a huge mistake. Fleet River’s lunch options change every day, but if you think along the lines of roasted carrot salad with tahini, chorizo, cream cheese and potato frittata, and cake combos such as chocolate and Guiness or almond and polenta, you’ll have a good idea of what a treat you’re in for. Make a beeline for downstairs, where a quiet atmosphere reminiscent of your auntie’s living room awaits. The popular GRIND chain has moved west, so you can get the Shoreditch experience right here in central (beards optional). Their cafes have a reputation for awesome coffee, and I can attest that it is indeed pretty impressive – what also stands out is their cracking music choice and various lunches and brunches on offer. Smoothie bowls and avocado toast most definitely feature for full-on East London feels. Don’t be put off by the limited seating in this Seven Dials’ café – the coffee is more than worth squashing up to a stranger for. Over 35 years old, Monmouth Coffee has branches dotted around the city that are answering our calls for incredible coffee amidst the avalanche of Starbucks’. The baristas at the Covent Garden original are award-winning coffee experts and worth talking too- they really know their beans. Timberyard Seven Dials is the perfect place to network and host meetings if you are living the freelancer life. There are rooms to hire, decent wifi, and also a fabulous selection of cakes and bakes. Their Covent Garden café is also a relaxing place to settle down with a book and a sarnie – roast salmon, romesco and watercress toastie anyone? Neal’s Yard, the most colourful corner of London, is hope to the famous Wild Food Café for when you want a perhaps more wholesome treat to accompany your coffee. This plant-based eatery creates culinary magic so you won’t even be able to guess that your dessert is a nutrient bomb. From vegan banana bread to completely cheese-free Smoked Apple Cheezcake and even Salted Caramel Mylkshake made with coconut, cacoa and almonds, these creations have to be tasted to be believed. To say that Covent Garden is chocca-block with cafes and places to stop for coffee is an understatement. As well as the usual Starbucks and Prets, there are the slightly fancier, usually tourist-filled, ones in the Piazza and a plethora of pubs and restaurants where you can also get your caffeine fix. When a new café opens, therefore, I always greet it with trepidation, wondering if it will manage to compete with the 10 other establishments within the surrounding five square metres. A little out of the manic hubbub of the actual market, a new opening on Drury Lane, aptly named Drury 188-189 (just to make locating it that bit easier), may indeed survive the competition. With a stunning spread of cakes, bakes and salads on offer, and a rather rustic-styled interior, Drury 188-189 is immediately welcoming. Another bonus is the fact that their coffee is actually pretty darn good – smooth and not too strong, and unlike a lot of the chi chi hip cafes, a decent size. If you want somewhere to switch off in Covent Garden, this beautiful value for money coffee haven is a gem. ‘Christmas’ and all that comes with it, the songs, the madness, the big brands and the adverts, seems to be creeping earlier each year. 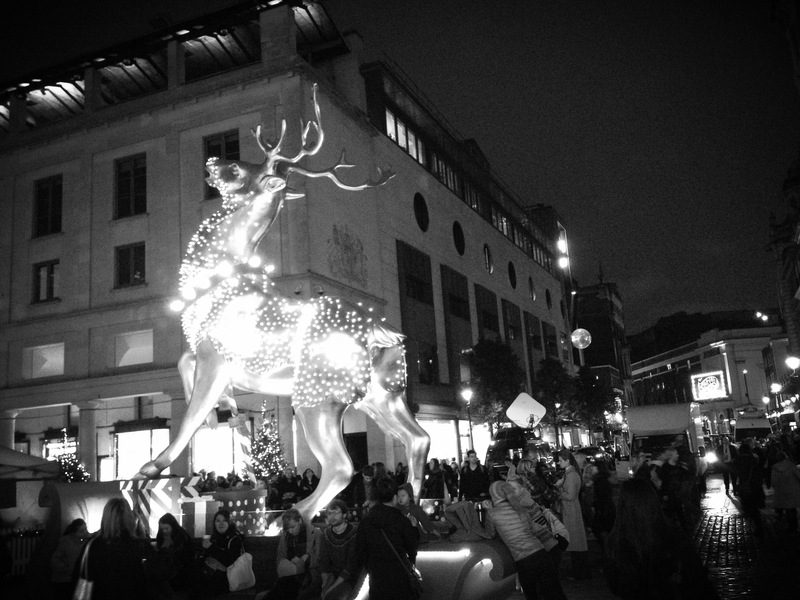 As soon as November rolled along, Oxford Street and Regent Street went into Christmas mode – entirely prematurely if you ask me. By mid-December, the novelty and excitement of all things Christmas will have worn off, and no doubt the tune of Mariah’s ‘All I Want for Christmas’ will be a grating sound on tired ears. But seeing as we, the little Londoners who are powerless in the face of the capital’s decision on when Christmas should start, can’t do anything about it, we may as well try and enjoy the (way too early) festivities. 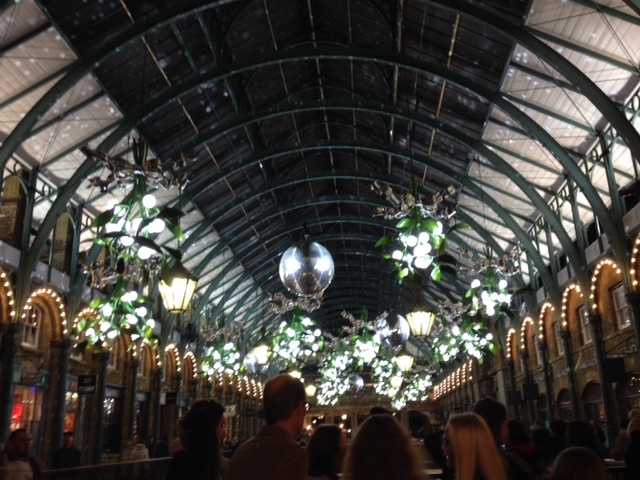 Last night I wandered down to Covent Garden’s piazza, for the switching on of the famous lights. Not a length of tinsel in sight, these decorations are tasteful and magical; moving projections of snowflakes and giant mistletoe make for a cracking display. I must admit, the giant reindeer, the old fashioned lanterns and the glitzy disco balls alongside a comforting waft of mulled wine gave me that warm and fuzzy feeling. A Harrods Christmas pop-up shop has even opened next to the Royal Opera House; ridiculously Christmassy to walk around, despite the fact that even the chocolate coins are more than a student budget can stretch, and could easily get you a pint in Wetherspoons. For the next few days, Covent Garden is hosting their first Mulled Wine Festival, which is worth checking out if you fancy a hot cup of Glogg or a spiced cider. They even have micro-pigs to pet – insanely cute and a real crowd-drawer. Not sure how related to Mulled Wine these little things are, though. Unless someone tries to keep them warm and wraps the pigs in blankets (warning: keep away from any ovens). 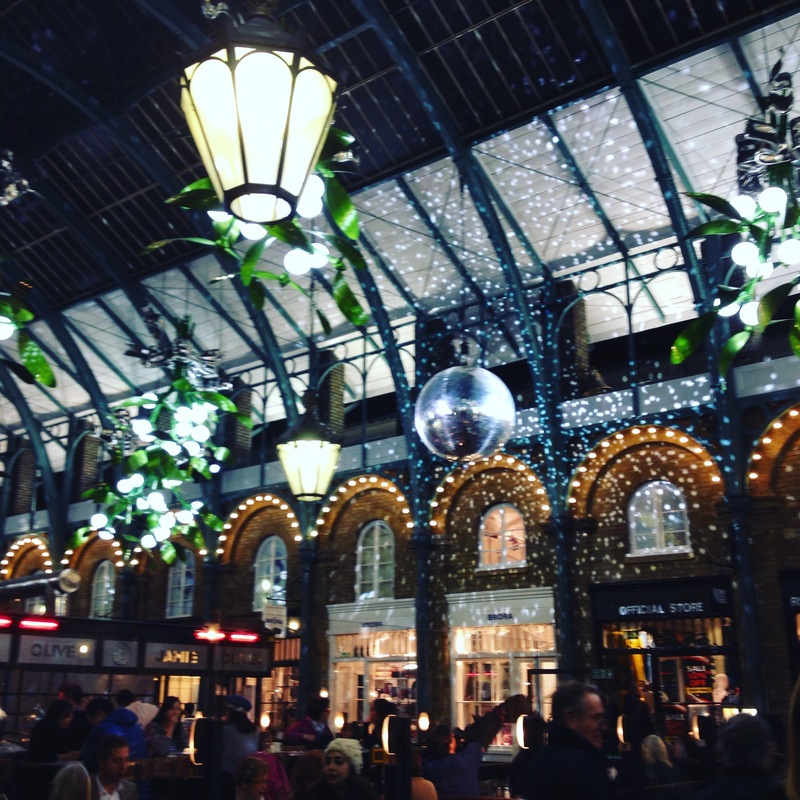 For a slightly early Christmassy feeling, a shopping trip less daunting than the infamous Oxford Street, and an excuse to check out the many cafes, pubs and bars around one of London’s prettiest areas, I would put the lights in Covent Garden on your ‘To Do’ list asap. DISCLAIMER: London’s My Lobster does not take responsibility for any over-consumption of mulled wine, or any overspending on super-cute Christmas baubles. It’s a strange thing, living in London, in that those that do reside in the city have rarely done the ‘London’ things. Ask any flat-sharing creative in Shoreditch if they’ve been on the London Eye, or a penguin-suited office worker in the city if they’ve ventured into Madame Tussaud’s, and the answer would probably be no. These things, these ‘London’ things, are for Tourists, right? With regard to a number of these attractions, I would have to repeat their answer, possibly adding that I don’t actually want to see hundreds of wax people, or that being scared by blood-stained actors in the London Dungeons is hardly my idea of fun. And M&M world? If I wanted to spend £20 on a minute amount of confectionary, I’d go to Harrods, darling – at least I’d get the bag to prove I was ultra-posh-and-sophisticated (would I have to pay 5p for that now?) Tourists and visitors come from far and wide to take in what our city has to offer, but living here, we should have the advantage of knowing what is worth spending money and time on. Despite being a Londoner for a good four years now, I had never set foot in the Tower of London, brushing it off as another ‘Tourist’ thing to spend a tenner on. How I was mistaken. Aside from the impressive nature of the building itself, the history, exhibitions and stories that go alongside the Tower are fascinating. An added bonus was visiting a) fairly early (I mean BEFORE 11am – aka – very early indeed), and b) on a weekday that was not half term. These factors made for a somewhat calmer explore around the site, and more opportunity to get up close to the various exhibits and interesting bits. Note – all of it is interesting. I had the opportunity to go to the Royal Armouries’ new exhibition in the White Tower, which has been specially put on to celebrate the 600th year of the Battle of Agincourt. To many, The Battle of Agincourt might only sound familiar because of Shakespeare’s Henry V, or Laurence Olivier’s role in the famous 1944 film adaptation of the play. After visiting, however, I learnt that the Battle of Agincourt was one of the pivotal battles in the Hundred Years War, and is about much more than shooting arrows and chainmail. 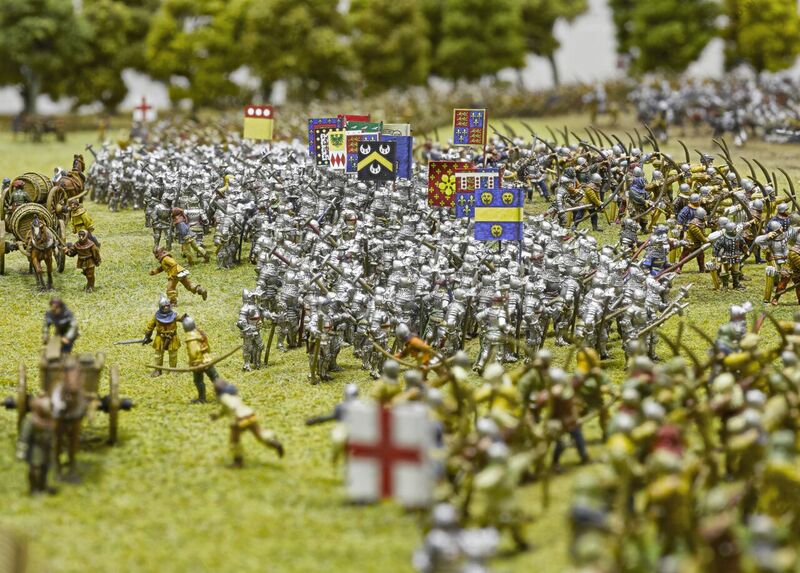 Perhaps the most impressive part of the Agincourt exhibition is the epic centrepiece; a (pretty much) historically correct model of the battle featuring over 4000 detailed scale model figures. This is model making taken to an entirely new level. A ridiculous amount of tiny men and horses are posed, mid-battle, mid-mudbath, portraying the utter chaos and destruction of Agincourt. I talked to Alan Perry, one of the modellers who took on the crazy challenge of creating the thousands of figurines, and was suprised to find out he didn’t use a single magnifying glass during the 2 years it took to create the work of art – the modelling was all done with the naked eye. This is one man that possibly should not have gone to Specsavers. I left the exhibition enlightened, impressed and grateful; enlightened as to the historical facts and significance of the Battle of Agincourt; impressed at the intricacies of the modelling; and grateful that I wasn’t one of England’s archers wearing 25lbs worth of chainmail on the battlefield. Clearly, we should take this opportunity, in the 600th anniversary of the battle, to learn about one of England’s most important wins against the French. 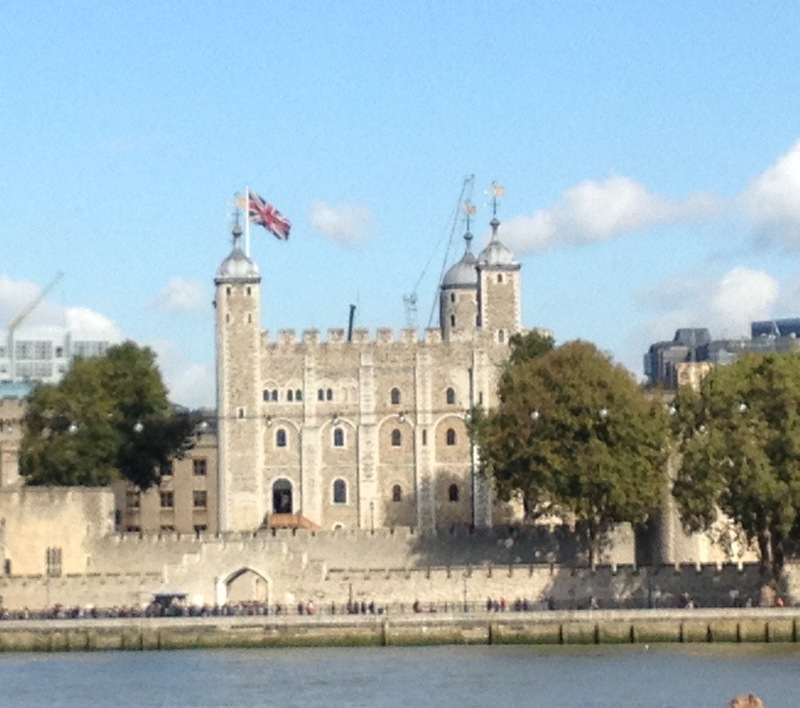 I also couldn’t believe I’d never been to the Tower of London – how could I have passed the site and never set foot inside the ultimate London time capsule? We should, as Londoners, make a conscious effort to do those bits of the city that we may have discounted as being Touristy options. Not going to some of the best institutions, exhibitions and attractions in the world just because we LIVE here seems like cutting your nose off to spite your face. This is a major misconception (No.1), my fellow London-lodgers. (See list for others). Not going to aforementioned ‘London’ things as they are for Tourists. We actual Londoners need to get to where we want to go MUCH quicker than everyone else. We are MUCH more important. That we look way cooler holding a take-out coffee. This coffee can’t be from a chain, though, it has to be from an indie-cold-brew-artisan-roasted-organic-milked caffeine house. *this is not a misconception. This is wholly and utterly completely true.